Located 10 Miles Southwest of The Loop. West Lawn is considered to be a “melting pot” of sorts, due to its constant change of races moving in and out of the area, as well as the diversity that exists there. It has a small town atmosphere in the big city. West Lawn is home to many Polish-Americans, Irish-Americans, Mexican-Americans, and other people of Latin American and Eastern European origin. The current Alderman of the West Lawn community is Alderman Marty Quinn. Chicago Lawn, to the east, was settled while the marshy land of West Lawn remained unsettled. Some housing was built during the 1920s, but it still remained swampy land. Houses were built during the 1930s which then reported German-Americans, Irish-Americans, Polish-Americans, Czech-Americans and Italian-Americans living in the area. The area had been growing until the Great Depression, when the economy declined. After World War II, growth continued and new houses and streets were built. The Airport Homes Race Riots of 60th & Karlov in 1946 were intended to keep black people out of the area. After the 1970s, more Mexican-Americans, Arab-Americans, Irish-Americans, and Polish immigrants started settling the area. 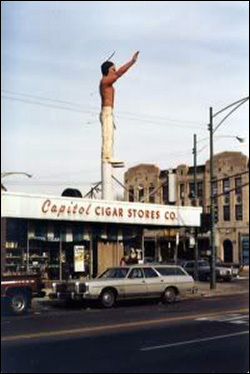 One small business in the neighborhood, the Capitol Cigar Store at 63rd and Pulaski, features a tall Native American statue as the landmark of West Lawn. The statue is most notable for being seen in the movie Wayne’s World. West Lawn is also the home of the Balzekas Museum of Lithuanian Culture along Pulaski. It was founded by Lithuanian-American businessman Stanley Balzekas, Jr. and is the only museum in the US devoted to the subjects of Lithuania, the Lithuanian language, history, culture and politics, and to the Lithuanian-American experience. The Chicago Transit Authority’s Orange Line stops at Cicero Avenue and 59th Street. CTA buses also serve the area.